Group A: Sky vs sSak- The Sky has no end in sight! Games 1-3: Sky through cheese/macro games got a clean sweep over sSak. Group A: Mind vs Cola- Seems Mind "convinced" people to try Pepsi! Games 1-3: Mind through cheese/macro games got a clean sweep over Cola. Group B: Killer vs HoGiL- Rampage! Game 1 (Circuit Breaker): Players ended up spawning cross positions. Killer went with a pool first against expansion first from HoGiL. Killer tried a zergling attack which failed. He was pushed back and contained though he managed to break out and counter attack with no damage being done. Both players teched to mutalisks and looked even though Killer lost all his scourage on 2-3 mutas giving HoGiL a window of opportunity. Using his superior scourge advantage, HoGiL managed to give his mutalisks the chance to raid Killer's expansion killing drones and forcing Killer to attack. Having his eco damaged and facing a superior mutalisk number, Killer was forced to gg out giving HoGiL game 1. Game 2 (Heartbreak Ridge): Things end up reversing in this game as Killer decided to FE while HoGiL went for pool first. Despite HoGiL having the faster pool, Killer was able to amass enough speedlings to do some damage at HoGiL's expansion and wouldn't let up as both players teched to mutalisks. Killer ended up hiding a small speedling group and went for a backstab after HoGiL's own speedlings left his base (pic). 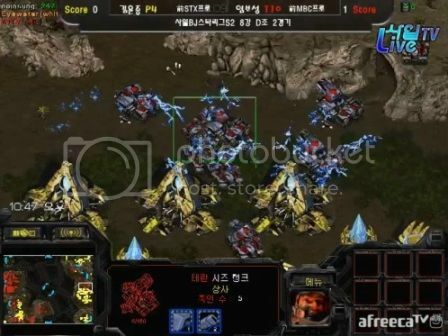 With good micro on Killer's side, HoGiL ended up losing lots of speedlings causing him to retreat. Killer then opted to attack with all his speedlings which were too much for HoGiL to handle who gg'd out. Game 3 (Neo Electric Circuit): Spawning cross positions, HoGiL went pool first to Killer's FE. 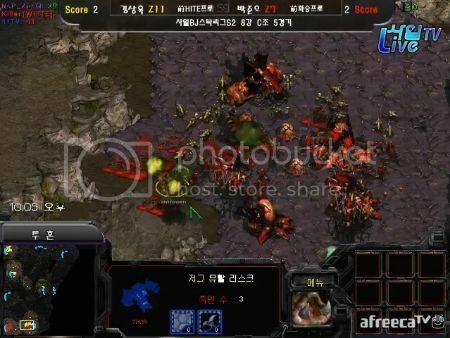 HoGiL managed to sneak a couple of zerglings into Killer's base at which point Killer decided to attack into HoGiL's natural killing some drones and speedlings before the sunken finished. During that attack, Killer grabbed his inbase mineral only expansion. Both players teched up to lair with HoGiL getting a much faster spire which he used to put pressure on Killer's mineral lines leading to multiple spores being made. With good mutalisk micro, HoGiL was able to eventually take down Killer's spire at his expansion leading him to go up 2-1. Game 4 (Match Point): Both players opted for similar opening builds of pool first followed by an expansion. Both teched up to lair and went with mass speedlings as their spires morphed. HoGiL tried to do some damage to Killer's expansion (pic) but mutalisks were out just in time to turn him back. 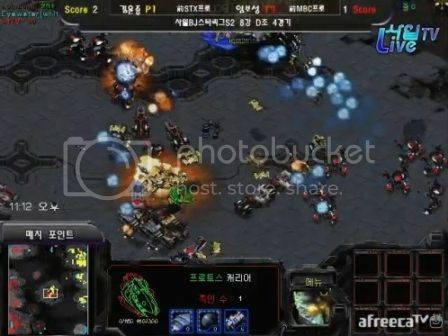 From this point on, there were several air battles with the deciding one taking place at Killer's expansion where HoGiL used up all his scourges with minimal kills. Killer ended up counter attacking HoGiL's expansion with his own army. 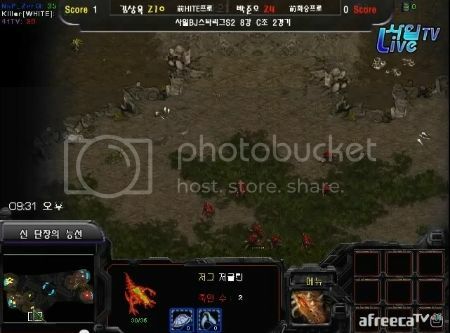 With some good micro on his mutalisks+scourge against HoGiL's own units, he won the fight to claim victory and tie the series 2-2. Close but no dice HoGiL! Game 5 (Fighting Spirit): To try and gain an eco advantage while playing safe, Killer went for an overpool pool then expanded behind it. On the other hand, HoGiL went for what looked like a zergling all in forgoing his own expansion. Killer looked to be in a rough spot as he barely managed to keep his expansion alive losing several drones in the process. He was also behind on tech seeing as HoGiL morphed his lair and was getting his spire. Though things looked bad for Killer, the extra hatchery and his constant pressure helped bring him back into the game. Spores provided protection against mutalisks as he teched to lair. In the meantime, HoGiL took his own expansion and followed it up with a large speedling+mutalisk attack that was well defended through good simcity, zerglings and sunken+spore support (pic). From this point, Killer had control of the game. With his spire recently finished, a large mutalisk force ravaged drones at HoGiL's natural. With his main under siege from mutalisks and his zergling counter attack failing, HoGiL tapped out with Killer taking the series 3-2. Group B: Sea vs Shuttle- Shuttle's heat evaporated the Sea! Game 1 (Circuit Breaker): To kick things off, Shuttle opened the first game with a proxy gateway in the middle of the map against Sea's factory build. Surviving some strong zealot attacks early on, Sea pushed using a tank with 3 marines+2SCVs as support. An engagement took place in the middle of the map with Sea taking out the proxy pylon to unpower the gateway as well as killing Shuttle's army in exchange for most of his own. With several vulture runbys and great mine positioning keeping Shuttle busy, Sea managed to grab his expansion and establish a strong economy. He managed to contain Shuttle who went for a break and succeeded losing a large portion of his army in the process (pic). Shuttle had to concede the game to Sea soon after due to weaker eco and a strong army coming. Game 2 (Heartbreak Ridge): Sea went for a factory expand while Shuttle went for his proxy robo. He used it to make a quick observer followed by reavers. With an observer out, Shuttle looked to deny Sea's expansion but siege finished just in time to repel his goons. After going up to 3 fac and having a small force, Sea left his base to take out the proxy robo but got caught with most of his tanks unsieged losing the engagement. After both players establish their third, Sea scans to catch Shuttle's carrier switch while he goes up to 6 fac and denies Shuttle's 4th temporarily. With Shuttle's army occupied with his ebay, Sea moves out with a large tank+goliath force to Shuttle's expansion. Shuttle seizes this opportunity and counter attacks Sea's bases. With barely any defense at home, Sea is forced to split up his tanks to attack multiple bases while sending his goliath back to defend. Alas, emergency dts, some good storms and new spawned units at Shuttle's main end the major threat while the goliath force is wiped out forcing the tie, 1-1. Game 3 (Neo Electric Circuit): Spawning at positions 7 and 10, Sea went for gas first followed by expanding in his back mineral only base. This delayed his factory and left him susceptible to goon attacks. After barely hanging on from some early zealot/goon 1-2 gate attacks and losing lots of workers, his bunker was destroyed by 3 goons losing him the game. Game 4 (Match Point): Sea opted for what looked like a fake double against a 1 gate from Shuttle. Both players grabbed their expansion with Shuttle doing so after adding a second gate. Not much harass happened as both played went into macro mode with Sea grabbing a faster third than Shuttle. This was done off one factory leaving him vulnerable. Sea went up to 8 fac adding on 4-5 factories at once and looked to hit a timing. Massing a sizable force and working on establishing his fourth, Sea moved towards Shuttle's expansion. His army was crushed by Shuttle who got a good surround and was transitioning to 2 stargate carrier. Sea wouldn't give up as he moved out with another force and managed to get some worker kills abusing the terrain. His army was eventually caught by Shuttle who does some serious damage while also sending some goons towards Sea's fourth killing many workers in the process and pulling Sea's army there. With that, Shuttle strikes at Sea's 3rd abusing the "cliffs" for his carriers while taking his own 4th. At this point, Sea was finished. His newly established 5th got taken out by the carriers, his 3rd was in shambles with barely and his army has been cut down to mostly goliaths. Against a large carrier force with goon support, he gg'd out giving Shuttle the game and the series. Since the series have all finished, we can determine our Ro4 participants. We have 2 Protoss players (Sky and Shuttle), 1 Terran player (Mind) and 1 Zerg player (Killer) giving us good racial distribution overall. I will try to post a preview of the semifinals so stay tuned for that! Despite Sky playing so well, I still want Killer to advance because a ZvT or ZvP final is better than a PvT or PvP finals. Ah, but sky is the new T killer! Would be good to see if he has what it takes in a grand finals. Killer vs Mind or shuttle would be epic though. Shuttle has some epic PvZ at times. Let us just pray it isn't a pvp! How can you not be a fan of someone who can Recall like this? Thanks for the good comments HoGiL was quite a beast against Killer. I didn't think he'll take it to a game 5 and a close one at that. It's just Killer had the better decision making that game but yes, he was very impressive and I agree, he would be a great player for LoveTV. Personally, I think Killer and Shuttle will advance. Thoughts in the other thread lol. I die from laughter every time I see that XD Sayle's commentary doesn't help either lol.